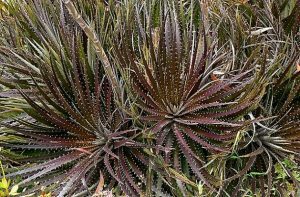 What’s more astonishing about Dyckia? That it’s kin to the pineapple or that it can withstand temperatures in the low teens? ArtisTree’s favorite Dyckia, a bromeliad, is the ‘Cherry Cola’ variety seen here. Its vicious blades require a careful touch (think very thick gloves and long sleeves), but dark burgundy leaves and perennial hardiness make it a plant worth the pain to showcase it in your Southwest Florida landscape. Native to Brazil and other South American regions, the ‘Cherry Cola’ Dyckia grows in supremely tight rosettes expanding via “pups” to three feet wide (or more). In the spring, tall spikes appear adorned with beautiful orange flowers on a reddish stem. Unlike the typical bromeliad which will bloom and die, the Dyckia will pup and bloom indefinitely. Dyckia (all varieties) are soil-dwelling bromeliads that can be grown much like cacti and succulents, in well-draining sandy soil away from heavily trafficked areas (the razor-sharp spines aren’t nice). Give the plants a fairly large berth to colonize and bright, full sun to maintain their stunning color. They are quite tolerant of rainy weather, provided that they’re in fast-draining soil, and mature plants will survive down to the low teens, but younger plants will need some freeze protection should cooler temperatures be forecasted. While drought tolerant, Dyckia enjoy regular watering during Florida’s summers and prefer a dose or two of fertilizer during the year. ‘Cherry Cola’ needs low-growing plant partners that won’t creep over into its habitat or require much weeding. 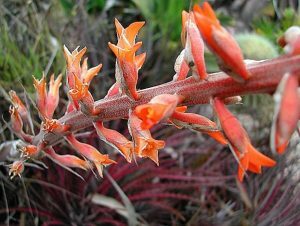 It would certainly be painful to remove any wandering stems or loose growth from the Dyckia rosette. With more than 90 Dyckia species and 150 cultivars, it’s easy to see why so many homeowners are willing to risk peril to plant a few in their landscapes. What plant geek wouldn’t want try out ‘Blood Bath’, ‘Red Ripper’ and ‘Snaggletooth’ varieties, too? 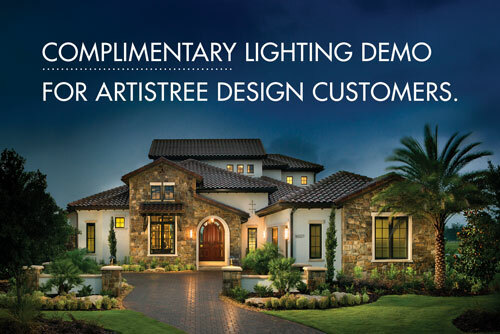 To try ‘Cherry Cola’ or any other assortment, contact your professional landscape design firm, ArtisTree Landscape Maintenance & Design at 941.488.8897 or artistree.com.